Taking the wonders and beauty of Native American culture and bringing it to a five reel and three row slot, Wild Spirit is a game which is certain to appeal to players who like fun and innovative gameplay. Allowing for up to 20 active paylines per spin and offering a generous top payline jackpot of £500,000, Wild Spirit also packs in a bonus game, scatter wins and free spins with an awesome 8x multiplier. A maximum possible payline jackpot of £500,000 is one of the most generous you will find anywhere. A whole host of fun and interesting extra features make Wild Spirit gameplay really immersive. Betting options from as little as 1p to as much as £2000 per spin are afforded to players. Wild symbols, free spins, scatters and plenty more besides introduces a plethora of additional ways to win. The Wild Spirit symbols and graphics are a little simplistic. There is very little about this slot’s gameplay or payouts that attract any further criticism. One of the most important aspects of any slot is the size of its top jackpot, and in that regard Wild Spirit truly excels. In order to trigger that most valuable possible payout, players must see five of the game’s white horse wild symbols line up along an active payline. If that five symbol combination does appear, the jackpot received by the player will be worth 5000 times that player’s bet per payline. As the game’s staking options allow for a maximum bet per line of £100, therefore, the maximum payout can be worth an exceptional £500,000. 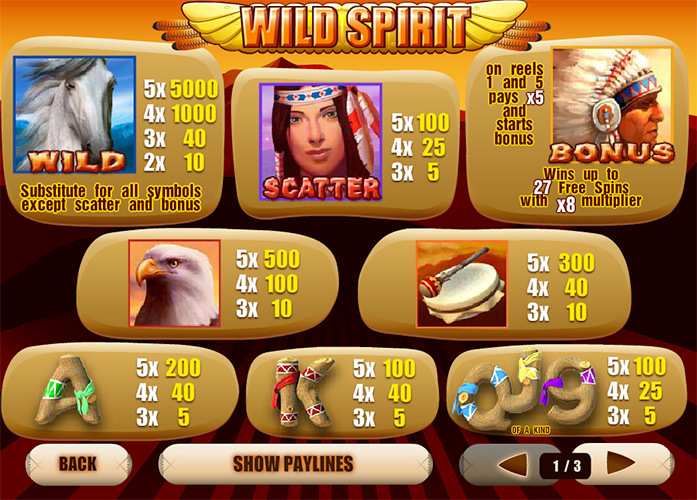 As if that massive top payline jackpot weren’t enough, Wild Spirit is also packed full of additional features which improve player’s chances of winning further, as well as adding extra interest to gameplay. Those features are the slot’s wild symbol, scatter symbols, bonus game and related free spins, and gamble feature. We’ve already talked about the white horse symbol’s value in making up a payline combination, but it also works as a traditional wild. Whenever it appears on an active payline it can substitute for any other symbol – apart from the scatter and bonus symbols – to make up the most valuable possible symbol combination. 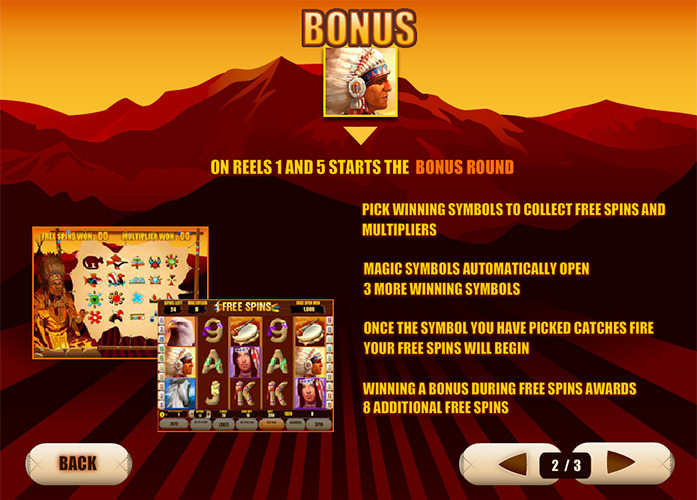 A beautiful Native American woman appears on the slot’s scatter symbols, which deliver instant wins when three or more appear anywhere on the reels. If it is three of the symbols on show the payout is worth five times the total bet, four symbols returns 25 times the total bet and five symbols triggers a 100 times jackpot. If the Wild Spirit Native American man symbol appears on both reel one and reel five at the same time, the slot’s bonus game is triggered. That game asks players to select from a collection of symbols with the selection determining how many up to 27 free spins will be awarded. Those free spins, too, will all boast a fantastic 8 x multiplier to boost winnings. After any winning Wild Spirit spin, players have the chance to gamble some or all of those winnings on whether a card will be higher or lower than the dealer’s card in a side game. If they choose to take the gamble, players could double the winnings they wager but will lose them if they choose incorrectly. 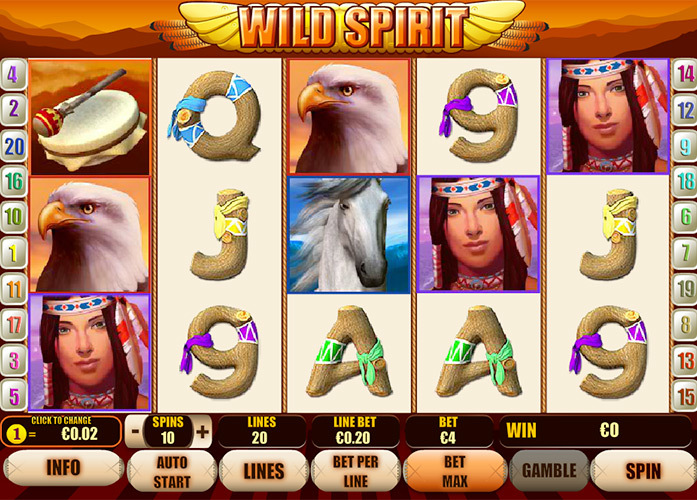 Taking the civilisation of Native Americans as its inspiration, Wild Spirit is a slot which sees its reels populated by symbols depicting images related to that civilisation. As well as the aforementioned special symbols, there are a large number of regular symbols of which the eagle symbol and the drum symbol are the most valuable. If five of the eagle symbols line up along one of the game’s active paylines, the lucky player will receive a jackpot worth 500 times their bet per line. If it is five of the drum symbols which appear, meanwhile, the payout will be worth 300 times the payline bet. As well as presenting players with a number of different ways to win generous payouts, Wild Spirit also gives them a good number of options when it comes to how much they can bet per spin. Players can, after all, set and alter the number of active paylines, number of coins bet per payline and the value of those coins. Wild Spirit features a maximum of 25 paylines but players can choose to have any number from that maximum down to just one, active at any time. Players, too, can choose to bet anything from one to ten coins per line and can set the value of those coins at a number of levels between 1p and £10. 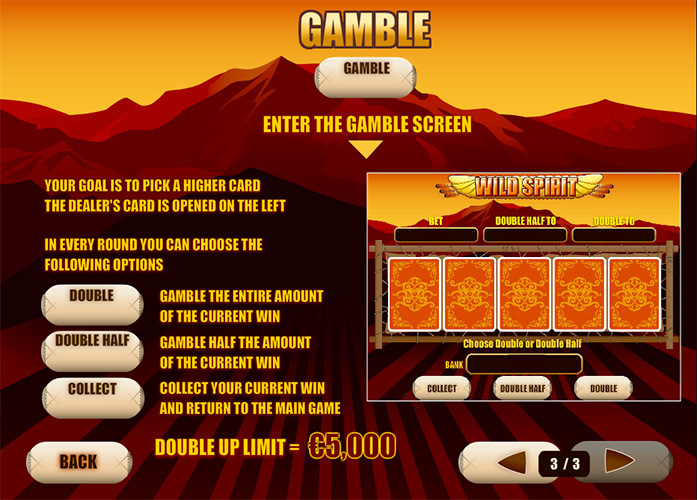 Innovatively themed and simply packed full of additional features, Wild Spirit is a slot that can deliver hours of fun but unlike other similar slots does not compromise on jackpot size to deliver that immersive gameplay. This slot, after all, still provides a top potential jackpot of £500,000 as well as giving players the chance to win instant payouts via scatter symbols and to trigger really beneficial free spins through a bonus game. Throw into the mix the fact that Wild Spirit players have one of the widest range of options around when it comes to setting their stake amount, and you find that this slot really is one to be admired. This game has a rating of 5 / 5 with 463 total reviews by the users.